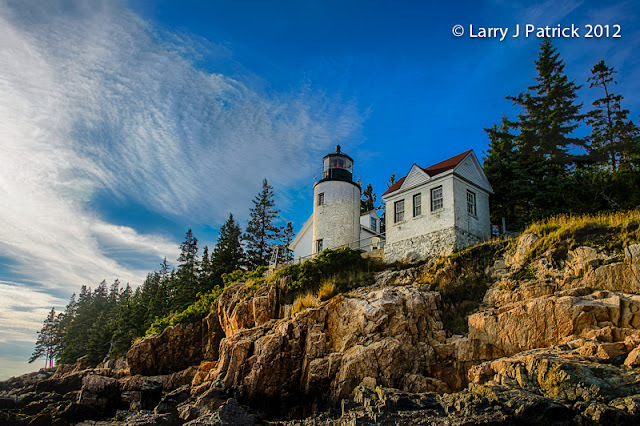 This is the lighthouse at Bass Harbor that is just outside Acadia National Park. The photo was taken about 45 minutes before sunset. I had some nice golden light on the lighthouse but the sky had little color from the sunset. Again, I took three photos to combine into an HDR image. I liked the golden light on the lighthouse versus the cool blue colors in the sky. Camera settings: Nikon D4, 28-300mm f/3.5~5.6 with at 28mm, ISO 100, f/16 at 1/90th, 45th and 20th of a seconds on a tripod. Lightroom 4—applied Landscape preset during import and exported three exposures to nik HDR2 where I combined the photos into an HDR exposure. Beautiful photo. I noticed that there does not seem to be any distortion in the lines on the buildings. Did you do something to correct this? The contrast between the golden light and the blue sky is interesting. I have been to this lighthouse and I find it interesting that you did not mention how tough it is to walk on the rocks below this lighthouse. Likewise, how were you able to setup a tripod? Nice job, much better than my photos of the same lighthouse. Photos that All Photographers Must Take—But Why?